"David A. Koester, Westbrook College, Class of 1977"
Westbrook College student David A. Koester, Class of 1977, was a General Studies/Social major and a Day Hop. For his senior class candid photo, which appeared in the 1977 Tower Yearbook, he wore dark jeans, a plaid flannel shirt and work boots. Dave's hair was parted in the middle, and he sported sideburns and a mustache. 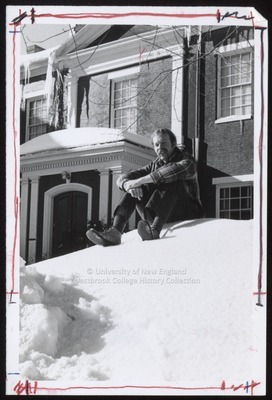 Dave perches on a high snowbank just outside Alumni Hall.